Have you ever felt trapped in your own mind? Afraid to seek help for the fear of being judged? (ME)ntal is an original dance theatre production produced by the student alumni of not-for-profit arts incubator 10 Square Youth. 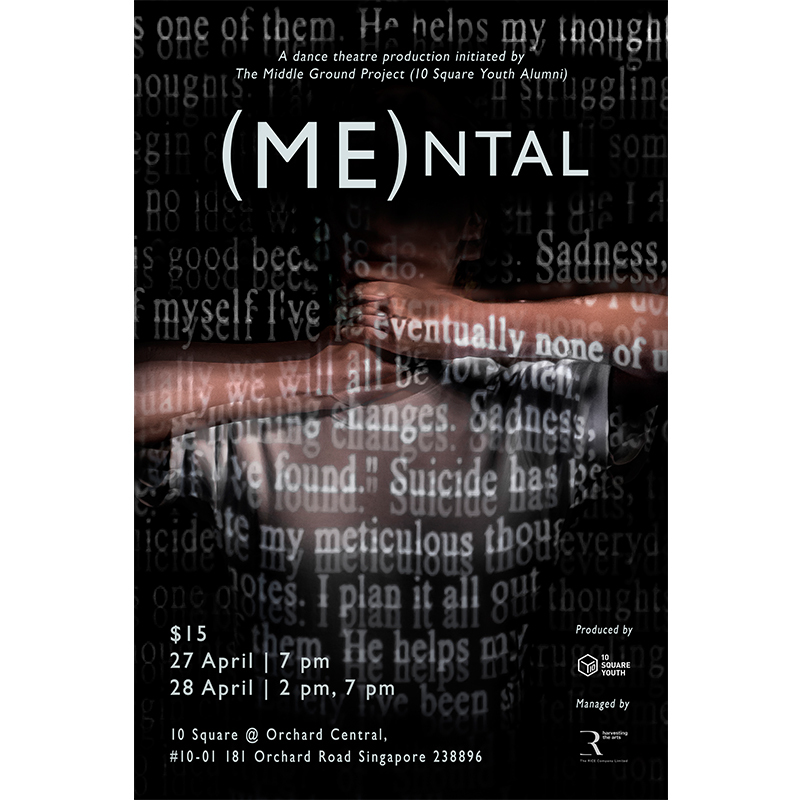 This performance aims to raise awareness about nine common mental disorders such as ADHD, anorexia nervosa, depression and psychosis among youths. Through the different genres of dance such as urban contemporary, lyrical hip-hop and hip-hop, (ME)ntal will shed light on issues and challenges that youths with mental disorders face. (ME)ntal seeks to empower and provide a voice to those who are suffering. (ME)ntal is choreographed and conceptualised by three youths – Cheong Rui En (17), Jihadi Bin Johari (19) and K Sharanmegha (22). In total, the cast consists of nine actor-dancers between the ages of 16 and 22 who have come together despite academic commitments to stage this production and bring a message of hope to the current generation of youths. The 10 Square Youth comprises a group of young people from ages 13 to 19 with diverse backgrounds who are passionate about the arts. They develop performance-orientated skills in dance, music, theatre and visual arts through the 10 Square Youth Arts Incubation Programme (AIP), which enables budding artists to become confident performers with the ability to engage the audience, hone technical skills and present themselves professionally as arts practitioners in pursuance of a career in the arts. 10 Square Youth is managed by The RICE Company Limited, a not-for-profit organisation that harness the potential of the arts and culture to empower lives and connect communities. The RICE Company Limited (TRCL) is a not-for-profit organisation and registered charity with IPC (Institutions of Public Character) status. TRCL seeks to harness the potential of the arts to benefit underserved children and youths in the community with a focus on arts education and placemaking of community spaces through artistic and creative content. TRCL manages two social funds (The Business Times Budding Artists Fund and Sing50 Fund), arts centres (The Little Academy and 10 Square Youth) in four locations across Singapore, creative spaces (The Pavilion at Far East Square and Temenggong House) and two subsidiaries (Global Culture Alliance and Millet Holdings). For more information, visit [url=http://www.therice.sg]www.therice.sg.